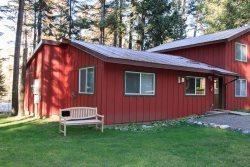 The 'Fawn' Wallowa Lake Studio Cabin is on the Flying Arrow Resort Property. Cabins 101-112, Minnow, Chinook, and Nez Perce are all close to this cabin, so other families or couples could join you close by. This location is also close to the Wallowa River and is in a central location. The bathroom has a shower, and the kitchenette is well-equipped. There is a charcoal BBQ for outdoor cooking on the cute little deck with a view. It's an easy walk to all the Wallowa Lake activities including hiking trails, horseback riding, go carts, restaurants, and more! This cabin only sleeps 2 people with having one queen bed. There is an electric fireplace which makes this cabin warm and cozy during the evening! There is also free WIFI available and a TV with a DVD player for those nights you want to stay in! Come to this adorable cabin and take in this incredible place we call Wallowa Lake.